In my opinion, we’ll see a pivotal shift in Technical SEO over the next few years from making website performance recommendations to instead focusing on open data strategies. In other words, how brands can use their data to secure organic visibility across a wide range of apps, platforms and devices. Back in 2010, a controversial article published on Wired proclaimed that the ‘Web is Dead’ off the back of research that demonstrated in the US that the proportion of internet traffic going to websites is slowly in decline and as a result lead to the eventual death of the web. I’m inclined to agree with them. Now, I’m not stating that the Internet is dead, it’s very much the opposite, with 3.17 billion internet users across the globe, up from 2.9 billion in 2014. However, the way in which we consume the Internet has radically shifted from desktop to mobile devices. For over a year now, according to Comscore, Mobile internet usage has overtaken Desktop in the US. 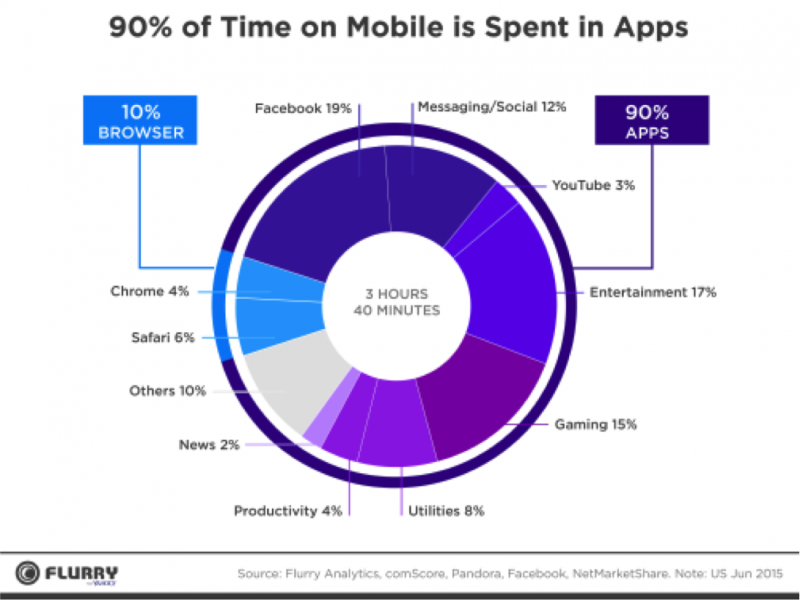 In addition, mobile users spend 90% of their time using Apps instead of Browsers to access the internet. It wasn’t a surprise when Amit Singhal (SVP Search) at Google confirmed that worldwide they are now seeing more searches on Mobile Devices than Desktop. Google is in the middle of radically adapting their search journey, giving more and more prominence to surfacing knowledge graph results or content from Apps instead of Websites. The impact of this in my opinion will result in Google gradually reducing Organic Traffic to websites. 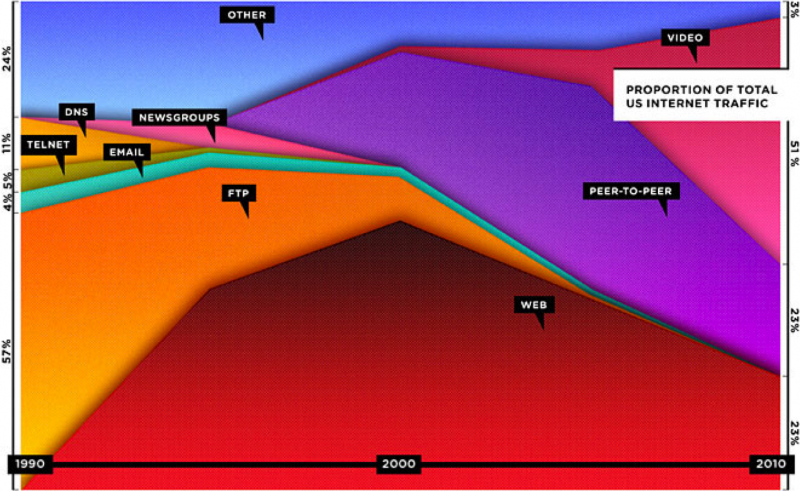 One of the most notable examples of this is much-debated gradual reduction of Wikipedia’s organic visibility. Historically, Wikipedia ranked 1st for every single informational-query, but with the growth of Google’s knowledge graph users can now get the answers they need without leaving the Google experience. 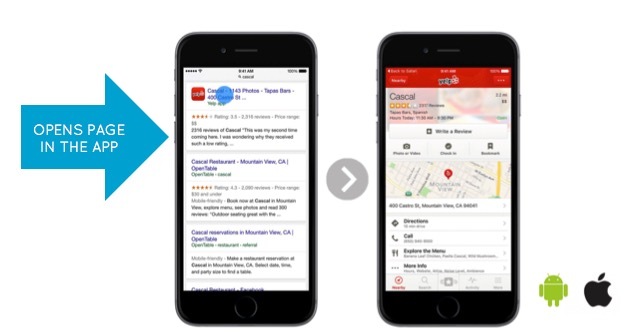 Just look at App Indexing & Deep-Linking for an example of this in action. It’s now possible to index pages from your app within Google results. For example, if you perform a search for a specific restaurant you’ll be able to see the businesses page from the Yelp App within the SERPs. If a user clicks on the result, it’ll open up the page in the app. Think about it, that search query experience (and many more like it) doesn’t require a user to interact with a web page at any point. 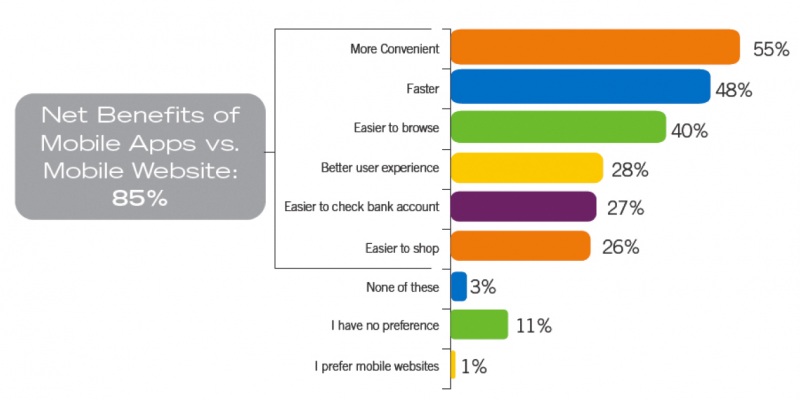 User studies have repeatedly shown that on the whole, people prefer using mobile apps over mobile websites when using their smartphone to use the internet. The top 3 reasons being that apps provide better convenience, faster speed and are easier to use – which all makes complete sense. However, apps do pose a problem in the fact they are ‘walled’ gardens that could result in the internet being progressively less ‘open’. The original vision of the internet set out by Tim Berners Lee in the 80’s is that the web would be unrestricted, and search engines such as Google and early browsers let Netscape enabled users to explore the wonderfulness that is what we call the open web today. The ability to visit any website without restriction or control. However, the situation isn’t the same with smartphones. 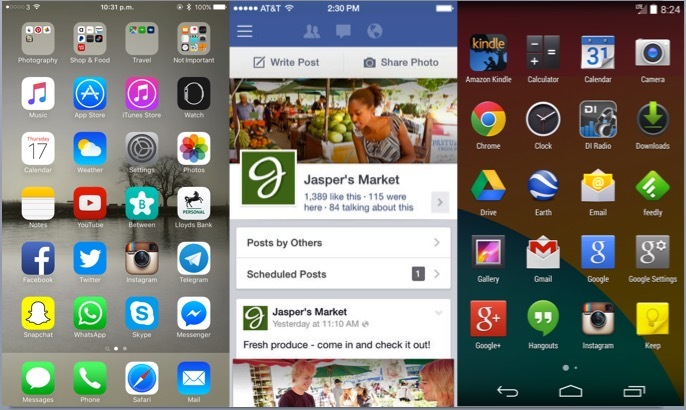 Google or Apple decide what Apps are allowed on their respective stores, control how the Apps interact with each other and take a revenue share. This is quite a closed system. Going further, Apps that allow business information such as Yelp, Facebook and TripAdvisor operate in a similar way, but arguably they provide a lot of benefits over ‘traditional websites’. Why Should Today’s SMEs Even Bother With a Website? 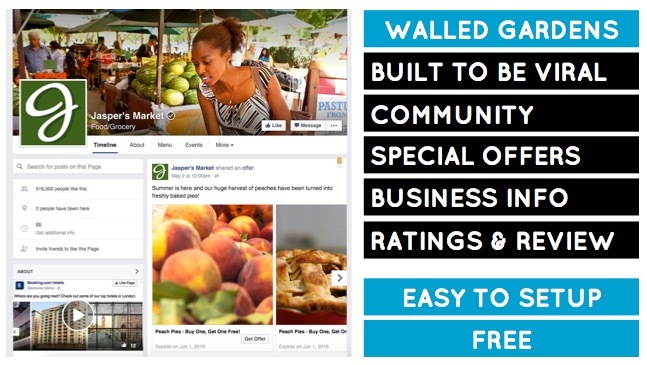 For example, small businesses with low-marketing spend can setup a page on Facebook for free that is essentially ‘viral’ out of the box with tons of useful features e.g. photos, reviews, discount codes that can help them market their business to a very targeted audience at a low cost. In addition to App Indexing. Google is increasingly giving preferential results to other forms of data such as to Structured Data results, Google Now Cards and recently AMP compatible pages. We’ve also seen Google’s search technology start to become a lot more conversational. If a user searches for a person e.g. ‘Homer Simpson’ you can then write a follow up query like ‘How Old Is’ and Google will automatically assume you are looking for more information on the person you last searched for, and instantly show the answer. Homer is 36 by the way. All of this combined is resulting in Website innovation to die. Nearly all new websites use an open source CMS system such as WordPress or Magento, with the HTML & CSS usually some form of framework like Twitter bootstrap and to top it all off – all websites look the same, using a flat, material design. Yawn. 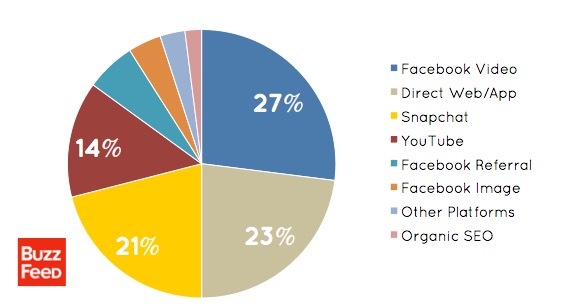 It’s no surprise then that Buzzfeed reported that 75% of their traffic came from other websites, Snapchat & Facebook Video makes up nearly 50% of their traffic leaving just 23% of traffic going directly to their website or app. Based on this, I believe we need to start talking to brands about their open data strategy. Advising them on how they can market their products, services and brand proposition by taking this data – whether that’s through a JSON-Based REST API or otherwise – and increase it’s visibility through third-party applications and platforms that have community they can tap into. Snapchat Discover is a perfect example of this in action, and it’s working very well for Buzzfeed. Mobile data usage on the Snapchat App nearly doubled after the launch of the Discover platform. In the interim, we start this journey by convincing brands to make their websites compatible with what I paraphrase as ‘lightweight’ JSON-based API’s supported by Google such as the AMP Project, Structured Data, Google Now Cards and Voice Assistants like OK Google and Siri. State of Digital has a range of resources on a number of these SEO tactics that I’d recommend reading and implementing to get started. All of this leads up to encouraging brands to create their own APIs which can seem like a challenging task. However, open source platforms such as a Deployd provide a simple mechanism to build APIs and I would also recommend reading ‘APIs You Won’t Hate’ to get a beginners level understanding of how you can achieve this. When it comes to online presence, brands need to start accepting that they will be progressively become an ‘entity’ in which users become aware of and purchase a brand’s products and services through a variety of applications, devices and platforms rather than a website directly. Excellent write up !! Thank you for sharing such wonderful information.